We cared for Mom at home for almost four years, read 15 books on Alzheimer’s and related Dementias, did loads of internet research, went to support groups and every doctor visit but nothing gave us the deep, first-hand understanding of what Mom was dealing with like the Second Wind Dreams® Virtual Dementia Tour®. As the adult child of someone living with Alzheimer’s, recently passed after nine years, I profoundly understand the difficulties, challenges, and struggles of loving and caring for someone with dementia. Every person with a loved one diagnosed with dementia, or even prescribed memory meds NEEDS the Virtual Dementia Tour®! The deep level of understanding after going through this short experience is unparalleled. It really should be given to caregivers/family before they leave the doctor’s office because it shortens the learning curve significantly. I was lucky enough to do this tour with Leeza Gibbons and some folks a few years ago, and it profoundly impacted my caregiving style. 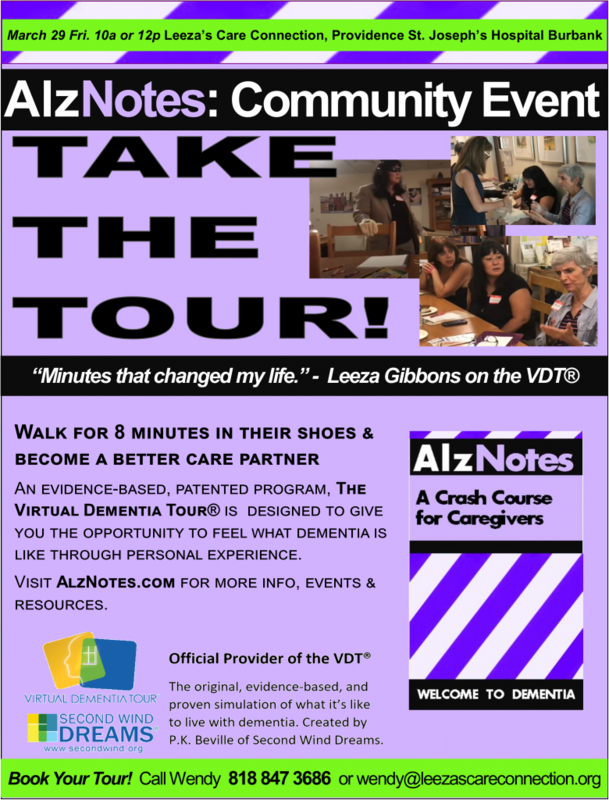 We became facilitators in 2018 and now AlzNotes incorporates the VDT™ as well as Teepa Snow’s Positive Approach® to Care in our Crash Course for Caregivers around Southern California at community centers and in families’ homes.